So today I saw a video where a TEN year old black kid was handcuffed or detained and wet himself. Of course it was mistaken identify. Last night I saw a video where 5 cops jumped a man of color. 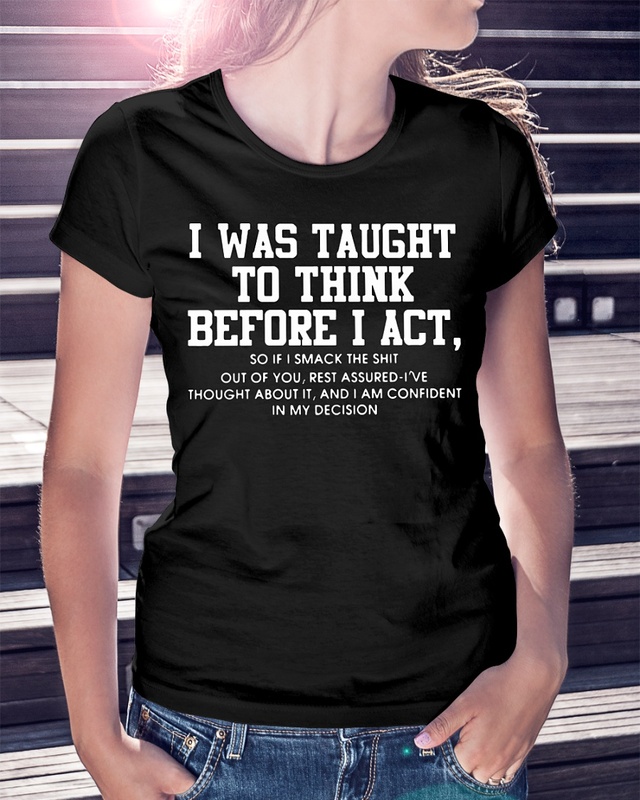 He showed no threat to none of I was taught to think before I act shirt, but they had to jaw him 5 times or so? Yesterday i saw a video of a white guy harassing an Asian lady” asking if she spoke English or was an American. He was also screaming Trump this and Trump that and how they’re gonna nuke North Korea. I also saw a video of the Mayor of Philadelphia saying he doesn’t get shirt by the cops cause he’s living that white privilege life. If you don’t think there’s a race problem or that the cops treat people of I was taught to think before I act shirt, you’re just living and enjoying your White life. This is America, NOT North Korea, we are allowed to express our freedom of PEACEFUL protest. If you don’t like or respect that, Then there’s something wrong with YOU.